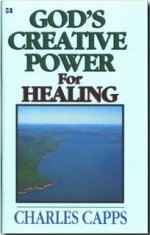 Description: God's Creative Power For Healing, by Charles Capps was first published in 1976, has sold more than 2.3 million copies! The lives of Christians around the world have been revolutionized by the powerful principles of confessing God's Word found within its pages. This powerful mini book combines all new teaching with scripture confessions for healing. You will learn how you can release the ability of God for your healing by the words of your mouth! This Capps minibook is a great way to build your faith for your health in Christ Jesus! Faith comes by hearing and hearing God's Good Word and this book is an awesome way to get your daily fill of God's promises for your health!